Water Year 2013 entered late winter with dismal snowpack development at ten of eleven CODOS dust-on-snow monitoring sites, Willow Creek Pass being the single exception. Through March 2013, snowpack SWE totals at all other sites resembled or even fell short of the very dry winter of WY 2012, raising concerns about back-to-back drought seasons. That broadly consistent spatial pattern in scant precipitation began to diverge in April, 2013. CODOS sites in the northern Front Range and Colorado River headwaters benefitted most from a series of April and May winter storms that augmented snowpacks and eventually resulted in average or even above average peak SWE levels on average or later-than-average dates. In the southwestern mountains, fewer and/or smaller April/May storms failed to offset the dry beginning to WY2013 winter. CODOS sites in the San Juan Mountains experienced, for the second year, substantially sub-par peak SWE values, on near-average dates. In between, the Central Mountains, Grand Mesa, Park, and northern Gore ranges came closer to but still fell short of average snowpacks. The Wolf Creek Summit and Upper San Juan Snotel sites near the Wolf Creek Pass CODOS site were among San Juan Mountain range sites where WY 2013 peak SWE fell far short of average values, extending the severe shortfalls in snowpack and SWE experienced in WY 2012. At the CSAS Senator Beck Basin Study Area at Red Mountain Pass, the primary CODOS monitoring site, WY2013 produced a total of ten separate dust-on-snow events, a lower total count than in the past three seasons. However, the actual mass of dust deposited at Senator Beck Basin in WY 2013 was greater than in any prior season, including the “Martian Winter” of WY 2009. Dust season began at Senator Beck Basin in November with a single event, February and March delivered four additional events, but the vast majority of dust deposition occurred during events D6 on April 8th and the long-duration D8 event of April 15-17. As of late March, dust layers observed at Senator Beck Basin were either weak or not present at CODOS sites farther north and east, creating some hope that WY 2013 might be dust-free in parts of the state. Then, dust events D6 and D8 spelled the end to that possibility with significant depositions statewide near the top of the snowpack. As at all CODOS sites, dust layers D6 and D8 played the principal role in very significantly reducing snowcover albedo at Wolf Creek Pass, and throughout the Rio Grande and San Juan River watersheds, as they became exposed, merged, and remained exposed. Melt rates at nearby Snotel sites were comparatively high and sustained, with perhaps slightly fewer and shorter periods of unsettled weather and smaller fresh snowfalls than were experienced farther north in the Rio Grande watershed (at the Spring Creek Pass CODOS site) and state, interrupting those periods of radiative forcing and slowing or reversing stream flow surging. Nevertheless, WY 2013 produced, to slightly different degrees, an early, compressed, and poor yielding snowmelt runoff cycle in both the San Juan and Rio Grande River watersheds. SWE accumulation and ablation for Water Years 2012 and 2013, with dust-on-snow events shown as brown bars, by date (as observed at the Senator Beck Basin Study Area). The long-duration D8 event of April 15-17, 2013, is shown as a heavier bar. 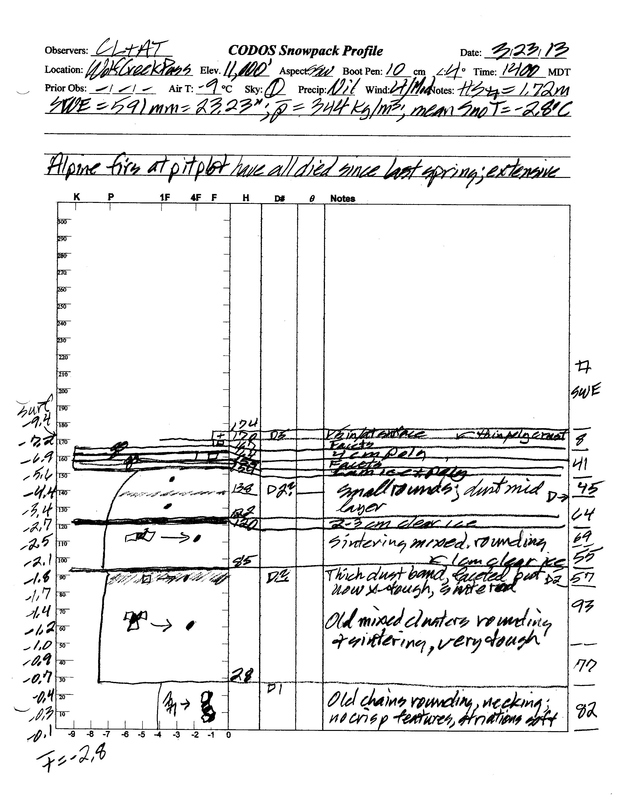 Note that not all dust layers observed at Senator Beck Basin were also found at other CODOS sites. Snowpack formation at the Wolf Creek Pass CODOS and nearby Wolf Creek Summit and Upper San Juan Snotel sites began late but dramatically with a significant storm (CSAS Storm #1) in early November, then stalled for several weeks, and eventually resumed in mid-December. Despite a period of stormy weather and significant SWE gains in December (CSAS Storms #4-8), by February 1, 2013 snowpacks at the Wolf Creek Summit Snotel site remained in the lower quartile of its periods of record and lagged behind WY 2012. 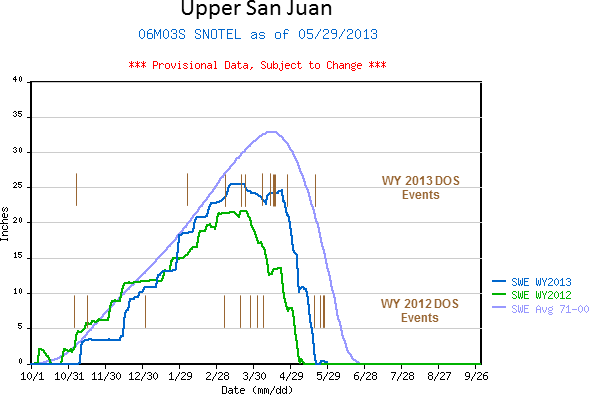 At the same time, the Upper San Juan Snotel just a few to the miles west had made better gains. 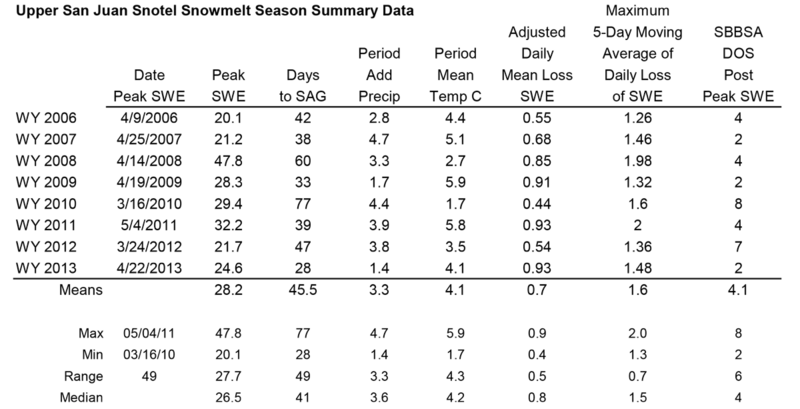 After a strong surge in late January (CSAS Storms # 10, 11, 12), SWE accumulation then proceeded during February and early March at rates comparable to the median rate of accumulation. Wolf Creek Summit still remained in the lower quartile of values and far behind WY 2012, due to the very poor start to the season. Meanwhile, largely due to the late January storms, at the end of January the Upper San Juan site surpassed WY 2012 and, entering March, was recording values just below median for the site. Overall, March was a poor month and both sites fell farther behind median SWE accumulation. Dust layers D1 (November 9), D2 (February 8/9) and either D3 (March 6-8) or D4 (March17/18) were all discernible within the snowcover in our March 23, 2013 snow profile and layer D5 (March 21/22) was present at the snowpack surface. Snow temperatures in this profile were comparatively warm, at a mean of -2.8° C.
On April 8 a storm (CSAS Storm #19) delivered both fresh snow as well as dust event D6, clearly present in our April 12 snow profile. That profile presented an effectively isothermal snowcover at a mean temperature of -0.15° C as well as clear evidence of recent melt episodes in and below the former snowpack surface containing dust layer D6 (since buried in new snow). That melt episode and perhaps earlier melt associated with prior dust layers contributed to the snowpack warming since March 23. Peak SWE at the nearby Wolf Creek Summit Snotel followed on April 22 (at 23.1”), eleven days earlier than the median date of Peak SWE (May 3) and 12.1” below the median peak SWE value of 35.2”. That peak SWE date was preceded by another winter storm (CSAS Storm #20) and the long-duration D8 dust event of April 15-17. Snowpack ablation got underway at the very shady Snotel site by the end of April and was soon enhanced by the emergence of dust layer D8 and the merging of layer D8 with layer D6 and earlier layers. 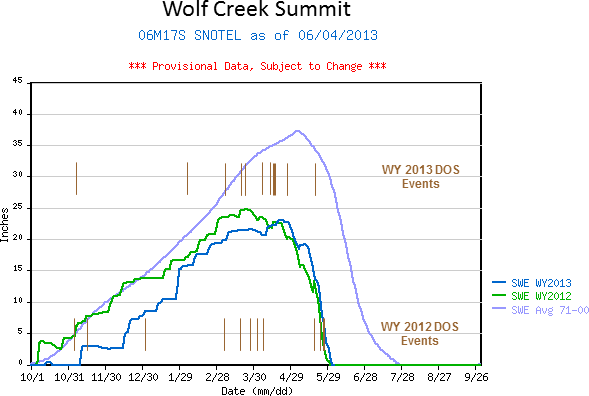 Aside from a minor rebound in mid-May, and despite the reduction in solar access produced by surrounding forest, snowmelt was rapid, and the Wolf Creek Summit Snotel recorded “snow all gone” (SAG) on June 2, just a few days later than in WY 2012. Nearby, the much sunnier, and somewhat lower elevation Upper San Juan Snotel site recorded SAG on May 20, having fully ablated a little more SWE in 13 fewer days. Our final Wolf Creek Pass CODOS site visit on May 1 found snowpack ablation well advanced at that open and sunny site, with dust layers D8-D3 merged at the surface and producing significant radiative forcing and acceleration of snowmelt there and in the surrounding snow covered terrain. See the Melt Rate discussion below. pack and event D5 was at the surface. Events D2 and/or D3 were substantially stronger than seen at Senator Beck Basin. immediately below D6 and snow temperatures had warmed from a mean of -2.8° C on March 23 to a mean of -0.15° C, effectively isothermal. 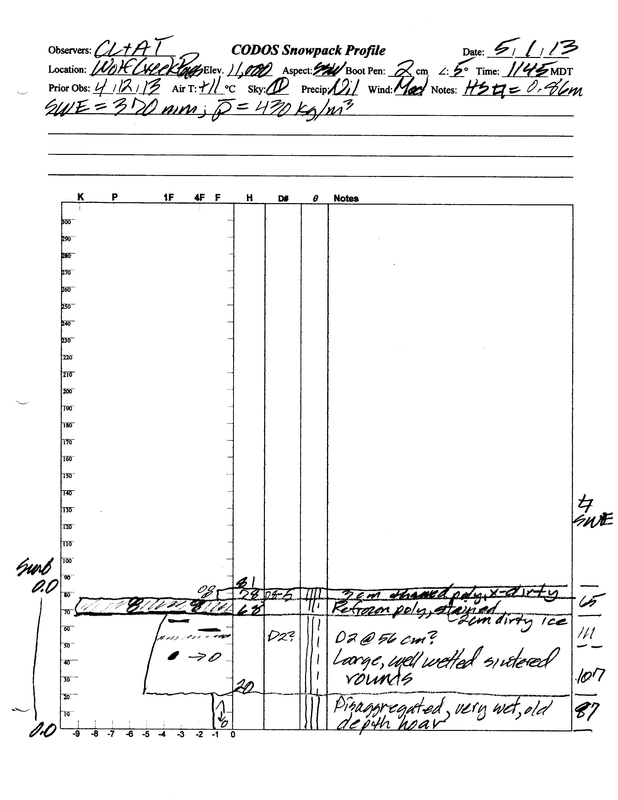 concentrated sample of all merged dust layers was collected adjacent to the snow pit for chemical and other analyses by USGS. The Wolf Creek Pass CODOS site is proving, over time, to reliably present a near replicate of dust layering observed at the Senator Beck Basin Study Area, in similar and sometimes even greater intensities. As was the case at Senator Beck Basin, layers D8 and D6 were the dominant dust-in-snow features but, as at Senator Beck Basin, the complete set of remaining layers D5-D1 also made a significant contribution to albedo reductions as layers D8 and D6 merged with those lower layers over the course of snowmelt. 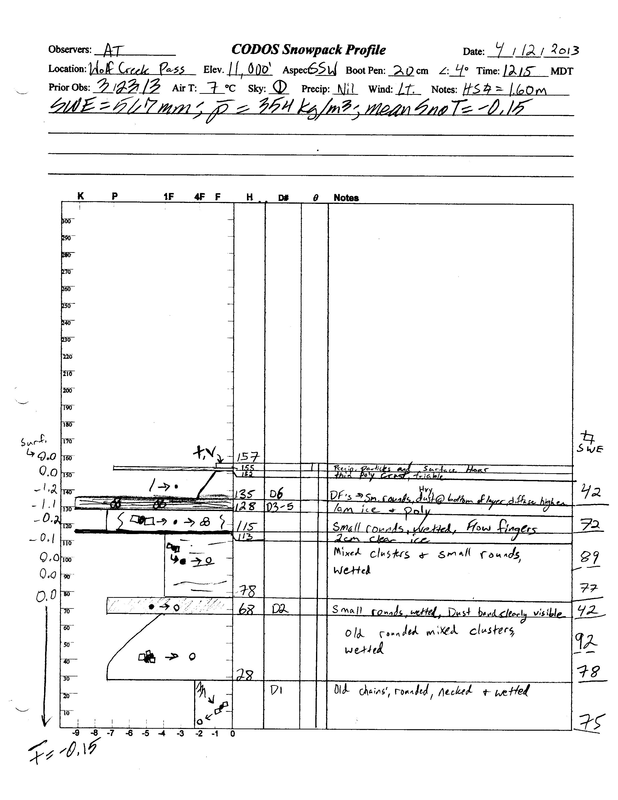 The very minor D9 and D10 events following D8 were comparatively inconsequential at Senator Beck Basin and, if present at all at Wolf Creek Pass, fell onto the extremely heavy merged D8/D6 layer. Even though the heavy dust layers D8 and D6 were deposited high in the snow column, and were quick to emerge following peak SWE, periods of unsettled weather in the Wolf Creek Pass locale often reduced the potential maximum radiative forcing effects of the merged D8/D6 (and lower) dust layers. Once merged, those layers experienced perhaps slightly longer periods of sustained exposure under clear, sunny skies than CODOS sites farther north. Still, cloud cover often did reduce solar insolation onto the exposed D8/D6 layer and/or minor amounts of fresh snow temporarily restored a higher albedo to the remaining snowpack and incrementally slowed melt rates at Wolf Creek Pass, for comparatively short periods. These effects on radiative forcing in dust are muted at the well-shaded Wolf Creek Summit Snotel site, but are more clearly reflected in data from the much sunnier Upper San Juan Snotel site. Analyses of Wolf Creek Summit and Upper San Juan Snotel data for Water Years 2006-2013 snowmelt seasons showing date and quantity of peak SWE, days from peak SWE to “snow all gone” (SAG), total additional precipitation after the date of peak SWE, an “adjusted” mean daily rate of snowmelt adding the additional precipitation to the peak SWE total, the maximum five-day moving average of daily melt, and the mean air temperature over the entire snowmelt period, from peak SWE to SAG. As discussed in prior years, melt rates at the shady Wolf Creek Summit site located in thick forest are routinely slower than those at the much sunnier Upper San Juan site, located among widely scattered trees. Following peak SWE at the Wolf Creek Summit Snotel of 23.1” on April 22, 2013, an additional 1.4” of SWE was added to the snowpack during the ablation cycle for an adjusted total of 24.5” of SWE available to melt. Aided by the intensity of radiative forcing produced by merged dust layers D8 and D6, and under slightly warmer mean air temperatures than in spring 2012, ablation to SAG took just 41 days. In spring 2012 an adjusted total of 28.9” of SWE required 63 days to ablate to SAG. Spring 2013 melt rates were as high as 1.5” SWE loss per day and the mean daily SWE loss over the entire snowmelt period was 0.60” per day, versus 0.46” per day the year before. However, because of the interruptions in radiative forcing described above, the maximum 5-day moving average daily melt rate was slightly lower in WY 2013 than in WY 2012, at 1.4” per day in spring 2013 versus 1.6” per day in spring 2012 . In the end, spring 2013 SAG occurred several weeks earlier than the median date of SAG at Wolf Creek Summit. 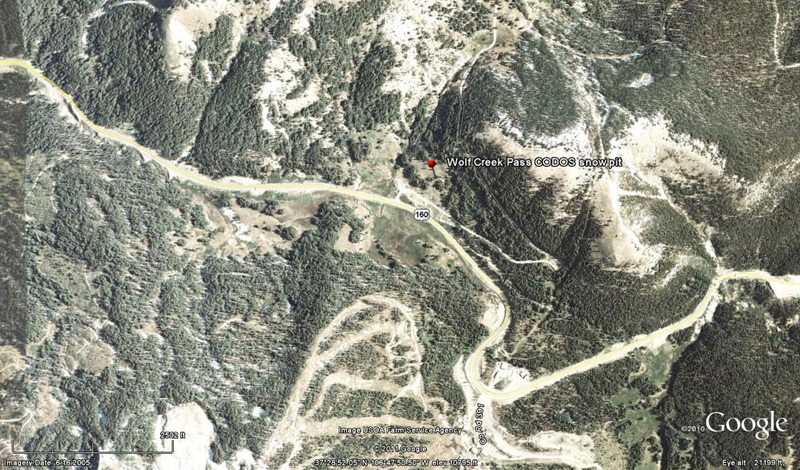 Again, it must be noted that the Wolf Creek Summit Snotel site is particularly heavily shaded by the surrounding forest, reducing direct solar access to the dirty snowcover. At the nearby Upper San Juan Snotel, located some three miles west of and 800’ lower than the Wolf Creek Summit Snotel, a peak in SWE of 25.5” occurred in late March, soon followed by event D6. Given the sunny nature of that site, some melt and loss of SWE followed before SWE resumed accumulating to a second ‘peak’ in SWE on April 22 of 24.6”, the same day as peak SWE at Wolf Creek Summit. For the purpose of direct comparison in melt behaviors, the table above and this discussion will utilize that second April 22 ‘peak’ in SWE at Upper San Juan. After April 22, an additional 1.4” of SWE was added to the Upper San Juan Snotel snowpack during the ablation cycle for an adjusted total of 26.0” of SWE available to melt. Then, over the 28 days from peak SWE to SAG, 1.4” less SWE was melted (to SAG) in 13 fewer days than in spring 2012, and under cooler mean air temperatures. That more rapid snowmelt was driven by the intensity of radiative forcing produced by merged dust layers D8 and D6. Melt rates were as high as 2.0” SWE loss per day, the mean daily SWE loss was 0.88” per day, and the maximum 5-day moving average daily melt rate of 1.5” loss per day was slightly higher than the 1.4” loss per day observed in WY 2012. In the end, WY 2013 SAG at Upper San Juan occurred some two weeks earlier than the median date of SAG, but later than in WY 2012. WY 2013 SWE accumulation and ablation at the Wolf Creek Summit and Upper San Juan Snotel stations, with upper and lower quartiles of period of record shown in light grey, middle quartiles in dark grey, and the median trace for the period of record shown as a dashed line. Comparison of WY 2011, 2012 and 2013 (in progress) hydrographs for the Rio Grande River Near Del Norte and the San Juan River At Pagosa Springs gauges highlight variations in snowmelt runoff timing and volumes over those three seasons. WY 2011 snowmelt runoff in the Rio Grande River watershed began late and then oscillated wildly as substantial dust-in-snow was alternately exposed and reburied under relentless spring storms. Eventually, flows surged sharply to an above-average peak near the average date of peak discharge, as dust finally emerged and remained exposed. Flows then descended at a normal rate for much of the remainder of the snowmelt runoff cycle. In sharp contrast, WY 2012 snowmelt runoff began a month earlier than in 2011, again exhibiting rapid surges followed by sharp declines before reaching a first peak in early May and a second peak later in the month, still well in advance of the median date of peak flows. WY 2012 total snowmelt runoff yields at the Del Norte gauge were very far short of average yields. This season, onset of WY 2013 snowmelt runoff in the Rio Grande watershed was almost a month later than in WY 2012 thanks to this spring’s unsettled March and early April weather, versus the extremely dry and sunny March of 2012. Overall, despite the frequent interruptions to D8/D6 radiative forcing described above, and the very erratic flows, the WY 2013 ascending limb shows a steeper rate of increase, to a higher peak, than in WY 2012. As a result, the WY 2013 peak in discharge was still weeks ahead of the median date of peak, but did come close to the median peak discharge value. As the calendar approaches summer solstice, radiative forcing of snowmelt is likely to be much more sustained in the remaining, very dirty snowcover. As of this writing (June 17, 2013) the Rio Grande hydrograph descending limb has fallen sharply, to less than a quarter of the peak level just as the median peak flow should be occurring. Total SWE available for melt was slightly lower this year than last, so the final WY 2013 hydrograph will, as in 2012, depict a rapid decline in discharge levels on the descending limb and another early, “flashy”, and very low-yielding snowmelt runoff cycle ending far below median discharge levels. 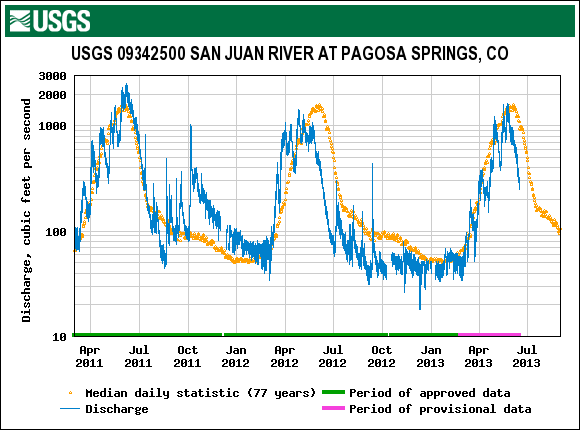 Flows at the San Juan River at Pagosa Springs USGS gauge during the past three seasons differ with the Rio Grande in notable ways, suggesting significant differences in weather behavior between the two watersheds, particularly during WY 2012. During Water Year 2011, San Juan snowmelt runoff more closely tracked median behavior at the Pagosa Springs gauge than Rio Grande flows at the Del Norte gauge, especially on the ascending limb. Late summer 2011 flows fell well below median levels at both locations. Then, Water Year 2011 began with a major storm on the west side of Wolf Creek Pass, delivering heavy rain at lower elevations in the San Juan River watershed and some four feet of snow at Wolf Creek Pass elevations (enabling the ski area to open very early). Over winter flows on the San Juan subsequently remained above normal until late winter. At the same time, Rio Grande flows at Del Norte recorded only a very minor uptick associated with that early October storm and then returned to near normal base flows before icing effects skew the data. During spring 2012 both locations saw an early and rapid onset of snowmelt runoff to a sub-par peak followed by a steep and early descending limb. Summer flows at both gauges were very low and WY 2013 on the San Juan River began at much lower flows than the prior year. This season, spring 2013 runoff timing more closely matched median behavior on the San Juan River, with only a slight delay, compared to a greater delay in the Rio Grande ascending limb. Flow oscillations were also perhaps larger in relative magnitude on the Rio Grande, perhaps reflecting that gauges lower position within the watershed. Both rivers produced peak flows close to their median levels but the Rio Grande peak was comparatively early, compared to the median date. Both hydrographs began their descending limb substantially sooner than their respective median timing and, as of this writing, their descending limbs are steeper than normal. Overall, the Rio Grande River is concluding a flashy runoff toward very low mid-summer flow levels while the San Juan River hydrograph shows a more typical ascending limb, followed by a steeper than normal descending limb that may also result in very low mid-summer flows.